As we embark upon the festive build up, my hopes for our Christmas campaign 2018 are higher than ever. For seven consecutive years we have broken sales records with our market leading Christmas campaigns, leading foodservice with innovation through our cross-category new product development. Intrinsic to Christmas, whether you’re a care home, a school or a 5* hotel, is desserts. As well as providing you with incremental margin opportunities, desserts inspire, they surprise and they delight year after year. Every year we strive not only to outdo our competitors with market leading innovation, but to outperform ourselves too. To do this we need to ensure that our desserts range wows you and your customers, reflects current market trends and also represents real value for money. 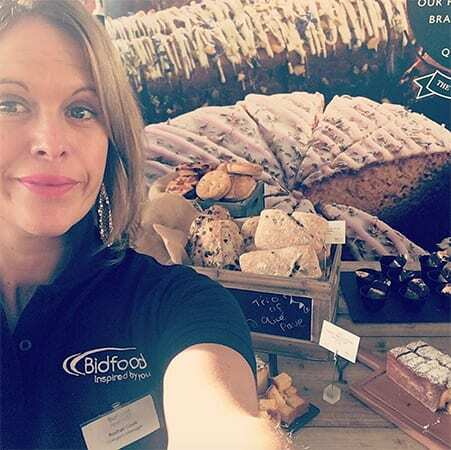 I work in the desserts category team and we spend a huge amount of time and effort researching the market, briefing suppliers and tasting product before finalising the range. We have to taste A LOT of desserts! (It’s a hard job but someone’s got to do it!). This is done over a year in advance to make sure we have plenty of time to gather feedback and allow you the time you need to plan, write and print your Christmas menus. Working so far in advance can be a bit tricky as it’s not easy to predict what the future festive trends will be, especially when Christmas ranges haven’t even hit the shelves! So we have to think outside the box, be bold and set the trends ourselves. This year we have some real showstoppers to wow you with. We’ve taken nostalgic festive flavours and given them a twist, bringing you a range that is modern, innovative and on-trend. Firstly we have the Premium Selection espresso martini cheesecake, which is a playful take on the popular after dinner cocktail. With layers of deep, dark coffee liquor, vodka infused cheesecake and a smooth, intense espresso glaze, this is the perfect way to end a meal (and it’s a firm favourite in the office too!). Then we have our Premium Selection salted caramel figgy pudding. A classic, traditional old English pud, given a modern twist with the inclusion of salted caramel, a flavour that doesn’t seem to be getting any less popular! Warming, comforting and indulgent yet surprisingly light, this hot pudding is packed full of figs, apples, pears and of course a generous splash of brandy (it is Christmas after all!). Next is our vegan showstopper, the Premium Selection Belgian chocolate & raspberry torte. Making delicious vegan desserts isn’t easy, so we’re really proud to introduce this product which doesn’t compromise on taste and is suitable for everyone, not just vegans. But don’t just take our word for it as this dessert comes highly praised not only winning best free from sweet product at the recent Q Foodservice Awards, but also scooping best overall free from product with a highly acclaimed Gold Q Award! Nostalgia is so important when it comes to desserts and no more so than at Christmas when we crave comfort and familiarity. Our Everyday Favourites baked rhubarb and custard crumble cheesecake taps into this important trend, taking an old fashioned sweet shop flavour combination and turning it into a cheesecake with a lightly spiced crumble topping. These are just some of the highlights from the range; others include a Christmas pudding cheesecake, a chocolate log loaf cake and a popping buck’s fizz cheesecake. And there is much, much more, so sit back and take a browse of the full range in our desserts & after dinner and sweet bakery Christmas sections. We hope you find the perfect festive dessert.